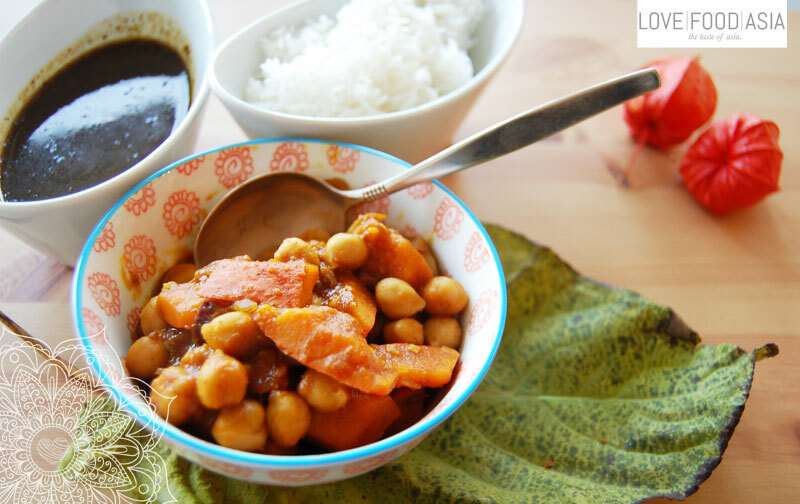 This chickpeas curry is strongly influenced by the Indian cuisine. We cooked this vegan curry with some friends from Stuttgart. Indian influenced and simple like all of our currys. The secret is to roast some of the ingredients before you start cooking. The taste is different and makes this meal a tasty adventure. Roast cumin seeds and chili powder in a wok or pan. Add sugar and wait until sugar starts to caramelize. Pour in 100 ml water, coriander and tamarind paste and mix well. Shut down heat and set aside. Heat oil in a wok or pan and roast the fennel seeds. Stir fry onions and garlic for 2 minutes. Add ginger and pumpkin dice and deglaze with 200 ml water. Cover wok or pan and simmer for 10 minutes on mid heat. Now add chickpeas, Garam Masala, coriander and turmeric. Simmer until pumpkin is fully cooked. Season with salt and pepper. Garnish with fresh coriander and serve with rice and Tamarind Paste.